Trying to throw a Halloween costume together at the last minute can be pretty stressful. We always have great ideas at the start of the semester and then all of a sudden you realize it's October 30th and tomorrow is Halloween and you have NOTHING to wear. But don't worry, I'm here to save you from that of that – thanks to College Mag, you'll have no excuse to have a boring costume this year! 1. Ryan Lochte – You’re sure to be a hit by dressing up as the hunk of a merman we all hate to love …or just don’t like at all. Throw on a Speedo, get yourself some grills and a makeshift gold medal and you’ll be good to go. Oh, and don’t forget the weird sneakers. 2. 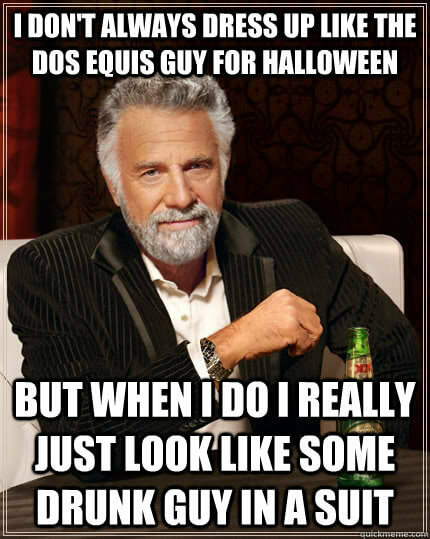 Dos Equis guy – The Most Interesting Man in the World. Need I say more? You can spend the time leading up to Halloween by practicing variations of the “I don’t always (insert verb) (insert noun), but when I do, I prefer (whatever).” Stay spooky, my friends. 6. Fifty Shades Trilogy – This one requires some deeper interpretation, but it will be well worth it. All you really need are the props on the covers of the books: a tie, a masquerade mask and handcuffs. Find someone tall, dark and handsome to tie up in the middle of the party and you’ll be the best Anastasia Steele there ever was. 10. Pregnant Adele – Stick a pillow up your shirt and start belting it out. But try to stick to the less depressing Adele songs – pregnancy is a happy thing!